Chief Julius Ardo and his wife Jane live in Garden Grove, California where the weather is in the 70's most days. 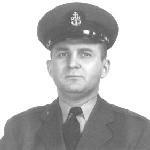 Julius, worked in Recruiting at NFB (NAS Grosse Ile) from 1947 until 1959. Other ships and stations he served aboard are: USS Arkansas BB33, USS Valley Forge LPH 8, PCS 1464 sub chaser, USS La Port APA 151 and USNAS, Los Alamitos, CA.